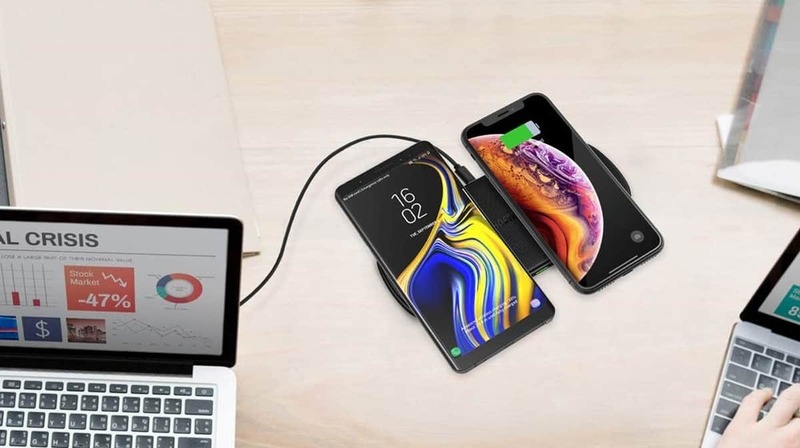 CHOETECH just upped the ante for the wireless charging pad market with its 5-coil dual charging model. Keep reading to learn more about it and find out what users think about this device to help you decide whether this is the right wireless charger for you. 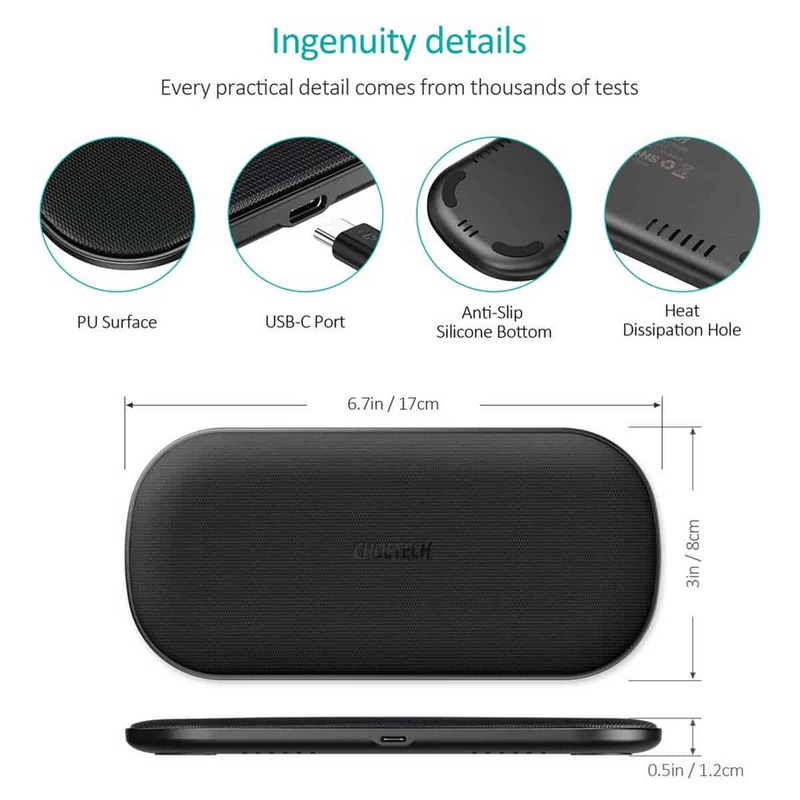 What Makes this Wireless Charger Unique? Wireless chargers have changed the device charging game, but most models on the market can only juice up one device at a time. Enter the CHOETECH 5-Coil Dual Wireless Charger, a 5-coil, 360° charging pad that can power two smartphones at once at 20W. Its 5-coil spread increases its charging area and improves charging efficiency for Qi-enabled devices. The device itself connects to an adapter or main power source with a USB-C port and supports fast wireless charging. Wireless charging pads offer a more convenient and tidier way of charging, but with the usual 3-coil models, you won’t be able to charge multiple devices at the same time because of limited charging space. For example, if you have two devices, you can only charge one device at a time. You’ll have to wait for the first device to finish before you can even get started on charging the second gadget. The only way to charge them simultaneously is if you have a second wireless charging pad. Buying two charging pads to indulge a cordless lifestyle might sound appealing. This is one gap that CHOETECH 5-coil wireless charger fills in. The 5-coil feature not only increase the charging space — it also lets you charge two devices at once. Aside from that, this feature can also supply 20W charge output, with 10W dedicated to each device when two smartphones are placed on the pad. However, note that juicing up two phones simultaneously may take a while compared to charging just one device. If you want to maximize your juicing speeds to up to 10W of fast charge, you can connect the pad to a Quick Charge Adapter. If you don’t have one, you can still charge your Qi-enabled phones at their optimal speeds with the USB-C port and its smart adapt feature. This CHOETECH wireless charger has a CE marking, is Restriction of Hazardous Substances (RoHS) compliant, and is certified by the Federal Communication Commission (FCC). This charger boasts of a built-in over-charging, overheat, over-voltage, and short circuit protection, thanks in part to its multiple heat dissipation holes that keep devices cool while charging. This wireless charger’s design offers a great balance of design and functionality. The pad comes with a sleek PU leather finish, an anti-slip silicone bottom, and a heat dissipation hole for precaution. Its sleek design definitely makes it a great fit for any modern home or office. It has enough space to fit up to two iPhone XS Max or Samsung Galaxy Note 9 phones. It also comes with a green LED light that indicates if the phone is properly positioned properly and if the session is done. You might be thinking more coil means more weight, but that’s not the case here. The CHOETECH 5-coil charger is actually very lightweight and portable, perfect for the techie on-the-go. Traveling with it also won’t be a problem. It doesn’t take up much space in your bag, and you can easily slip it inside your suitcase when traveling. The added coils also allow for 360° charging, making juicing up phones in any orientation (vertically, horizontally, or diagonally) possible. At $50.99, it’s pricier than most wireless chargers, but its 4.2/5 star-average Amazon rating and great reviews indicate that a lot of people who’ve shelled out on this product are happy with their purchase. 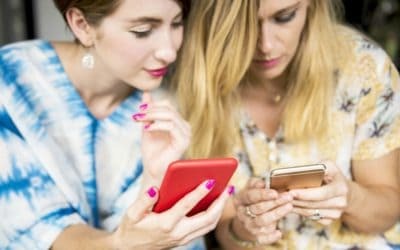 Check out some of what customers think in my compilation of Amazon reviews at the end of this post. Dimensions: 6.7 x 3 x 0.5 in. The CHOETECH’s 5-coil charger works on a variety of smartphones, including the latest Apple and Samsung models. Another thing to love — the product can detect which power output setting matches your phone. One downside is it doesn’t support smartwatches, iPads, or older versions of the Air Pods. It can only power up Qi-enabled smartphones and the new Air Pods. The good news though is you can simultaneously charge your iPhone and AirPods. 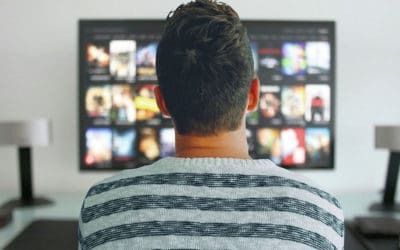 What is a Qi-enabled Device? Qi is a Wireless Power Consortium-developed standard for inductive electrical power transfer beyond distances of up to 4 centimeters. Note: This is a partial list of compatible devices, but it’s likely that newer phone models will follow suit with their wireless charging specs. Greater charging speeds and efficiency from its very first 5-coil technology? Check! Impressive safety features, you got them. Premium, sleek, build, and design? Check again! 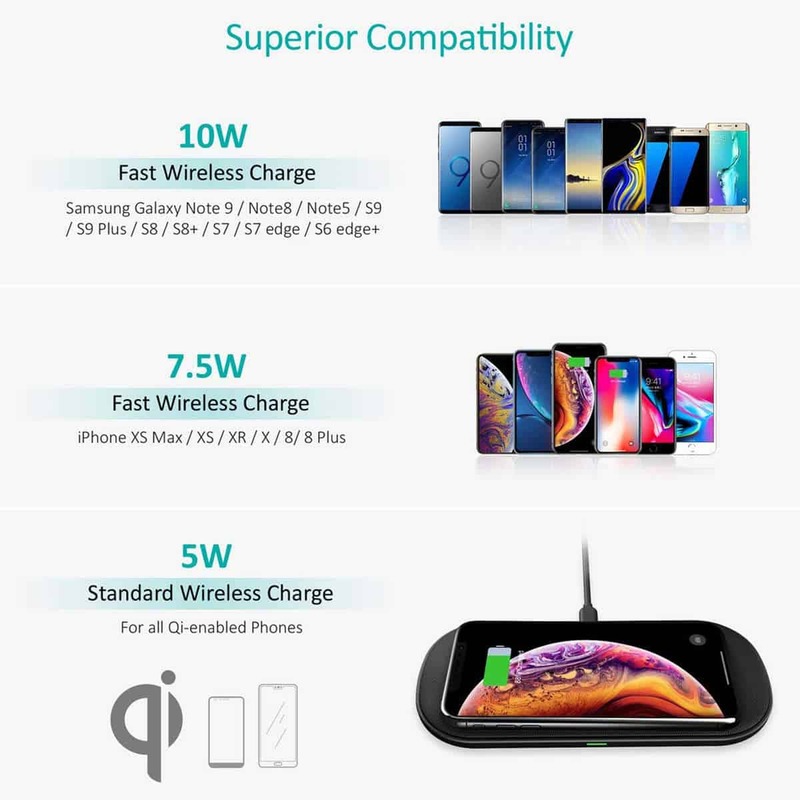 All these features and more make the CHOETECH Qi Fast Dual Wireless Charging Pad a force to contend with in the wireless charging market. I hope this review has helped you learn more about this device and in your search for the perfect wireless charger for you. Note: The CHOETECH Dual Wireless Charger mentioned above was provided to me at no cost or at a discounted cost in exchange for my unbiased review. Click here to purchase it on Amazon.com. Do you have any questions about CHOTECH Qi Fast Dual Wireless Charging Pad? Let us know in the comments section below! Huawei Mate 20 Pro: iPhone Killer?